I’m new to Mac having just got one after working with Ubuntu Linux for some time. Among the many things I’m trying to figure out is absence of colors in my the terminal window – like the ones that are shown (on linux) when you run ‘ls -la’ or ‘git status’… I just can’t figure out how to activate them in the actual shell. The colors are preceded by an escape sequence e and defined by a color value, composed of [style;color+m] and wrapped in an escaped  sequence. I always add a slightly modified color-scheme in the root’s .bash_profile to make the username red, so I always see clearly if I’m logged in as root (handy to avoid mistakes if I have many terminal windows open). For all my SSH accounts online I make sure to put the hostname in red, to distinguish if I’m in a local or remote terminal. Just edit the .bash_profile file in your home dir on the server.. However, I couldn’t leave this question without recommending my favorite application, iTerm 2. 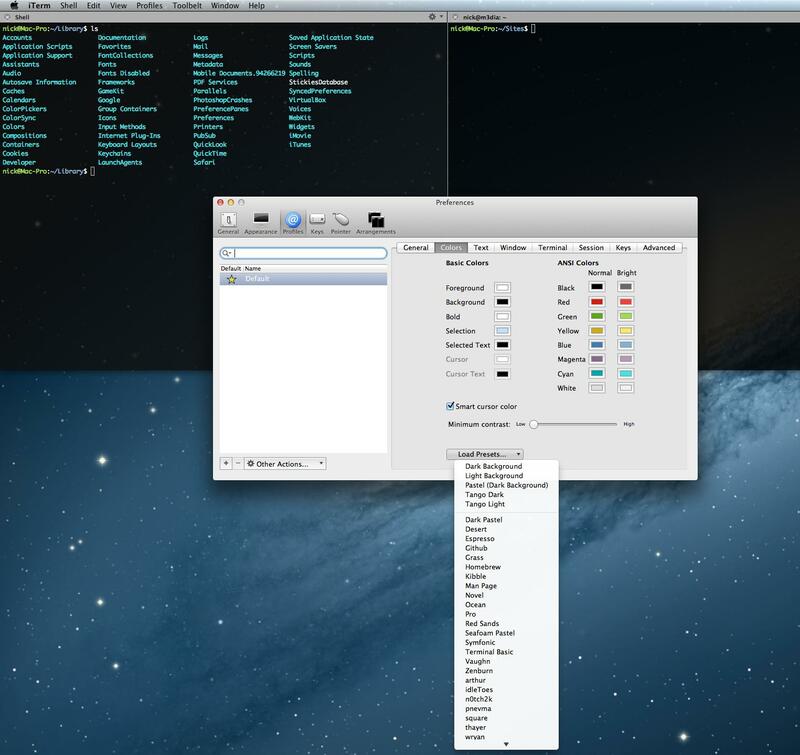 Here’s a screenshot of the iTerm 2 window and the color preferences. for an instant hide/show the terminal with a mouse gesture.